The battle of Face lock started with iPhone X called Face ID and a lot more phones have joined the race to introduced an additional security measure called “Face lock” or”Face ID” to foster the level of phone security with the popular phone fingerprint scanner. With the Facial recognition feature, you can unlock your smartphones by just looking at your phone. The use Face lock or Face ID to unlock smartphones is trickier compared to FingerPrint lock. While you can use up to five fingers to unlock your smartphones you can only set up a single Facial recognition on your phone with Face lock. 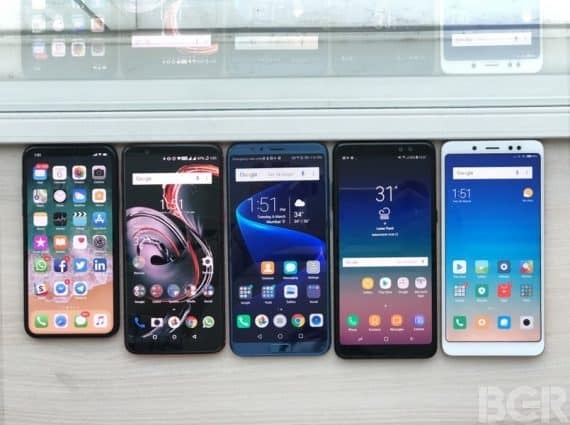 However, if you are a phone savvy and you are on the lookout for the list of phones with face lock or Face ID to buy in town, to foster your smartphone security with the formal fingerprint feature here are the list of most popular smartphone in the market with a low and affordable price in 2018. You may don’t want to forget that smartphone like Infinix S3 rolled out a Face recognition to its device OS recently to compete with other phones with the same feature. Contrary to phones facial recognition you may want to consider checking out the new Facebook facial recognition and Windows OS facial recognition. Apple iPhone X made Face lock popular on smartphones. Although, Apple did not call this feature Face lock rather “Face ID”. Apple iPhone X did come with a fantastic ID touch called “fingerprint sensor” and also a new Face ID to foster iPhone X security measure and require additional steps to unlock iPhone X not only with a touch ID but with a facial recognition. The facial recognition on iPhone X is recognized as the most advanced form of unlocking feature on iPhone X because it takes a lot into consideration when analyzing faces for unlocking and create an in-depth map for the locking face. iPhone X using the in-depth map created and IR technology in the system, the facial unlocking feature work perfectly where there are no direct rays of light such as in the dark or at night. The more reason why the iPhone X facial unlocking feature is recognized as the best form of advanced and while it is believed that most smartphones built on their benchmark is the ability of the unlocking feature to recognize your face when a change occurs such as the appearance of beard or due to makeups. Apple iPhone face unlocks phone feature isn’t as fast as touch ID that wakens the phone instantly when the background light is off. However, the speed is dependent on first, wake up the phone and place the front camera right in front of your eyes to recognize it for unlocking. OnePlus 5T is another popular smartphone with Face ID unlocking feature to unlock smartphone with your face instead of security PIN or password or FingerPrint Sensor. OnePlus 5T offers the fastest face unlocking feature and it happens in a matter of seconds. Although the facial recognition technology is not as advanced as iPhone X, it is currently the phone with the fastest face unlock feature. Other than locking your phone with face lock on your OnePlus 5T, you can create an additional set up to unlock the lock screen where you have to swipe first before you can access your phone or directly unlock your phone from the home screen. Unlock Apple iPhone X, OnePlus 5T Face unlock is instant. To unlock OnePlus 5T with face lock feature when locked you can either double tap the screen like other smartphones to wake the phone screen or press the power button and then place the front camera in your face. Honor view10 and OnePlus 5T have some similarity when it comes to scanning and unlocking of the locked screen with their face lock feature. Both Honor view10 and OnePlus 5T use their secondary camera to facilitate the unlock. Unlike Apple iPhone X and OnePlus 5T, Honor view10 got its face unlocking feature via OTA update to fully start unlocking locked screen. As a result of the update which wasn’t featured with the device from the onset, it makes it very difficult to unlock your phone in the dark without a low sensitive light. However, it is fast and easy to unlock honor view10 screen with the facial recognition feature and it takes only a few seconds to wake the phone from sleep and place the front camera on your face to unlock the device. Samsung Galaxy S8+ 2018 release default the face lock feature as a major feature to compete with Apple iPhone X, OnePlus 5T, and Honor View10. The face lock being a major feature to talk about in the device come in the same price range with OnePlus 5T and Honor View10. Samsung Galaxy S8+ uses it secondary dual camera to analyze and facilitate face lock on the device.The device offers a reach feature though, but in a low sensitive light, it’s very difficult to capture users face to unlock the screen. However, the facial lock works better to unlock your phone in a brighter bright environment. Unlike OnePlus 5T, Samsung Galaxy S8 and Apple iPhone X are a bit slow when it comes to unlocking your feature but with Apple iPhone X having good accuracy makes it better than Samsung Galaxy S8 in terms of face lock. This could be the reason why everyone is talking about Xiaomi Redmi Note 5 pro… But, I doubt it if it’s. Xiaomi Redmi Note 5 pro was not launched with face lock feature but made it through an OTA update to join the list of popular smartphones with face ID to unlock a locked screen. Xiaomi facial unlock feature works like most of the aforementioned phones above to unlock the device. The Xiaomi Redmi Note 5 Pro makes use of the phone front camera to analyze and facilitate unlock. The device accuracy makes the device to be able to unlock the phone directly from home screen, but the phone performs a bit poor when it comes to single tap and wakes the phone from sleep to use the face lock to unlock the phone. Don’t be surprised that Infinix Hot S3 featured as one of the best and popular phone with Face lock feature in 2018. The face ID feature doesn’t come at launch do but made it way through an OTA update to improve the security measure of the device alongside fingerprint sensor. Infinix Hot S3 uses the device front camera to save your face data during set up and use the same information to unlock your phone from the home screen. Unlike Apple iPhone X and OnePlus 5T, the Infinix Hot S5 performance to unlock the device in a low light sensitive environment is not as sensitive as others. The device uses the front camera to analyze and facilitate unlock feature and can be used directly from home screen. You can either double tap the phone screen to wake the phone and use face ID to unlock your phone or press the power button. From the list of the above devices, Apple iPhone X offers the best Face lock IR technology followed by OnePlus 5T and Honor view10. However, Samsung Galaxy S8+ performs relatively low compared to others but still within the range of a notable device with the face ID unlock feature.